Home healthcare service sector in India will get a boost of $10 million (over Rs 60 crores), with a leading player in the industry, India Home Health Care announcing an investment to expand its focus in 50 cities. Currently present in the South regions of Hyderabad, Chennai and the silicon valley of India (Bangalore), the company also offers services in Pune and Ahmadabad. The company’s founder and director V Thiyagarajan was also quoted in the media recently, saying that the current financial year would see the organisation launching services in Visakhapatnam, Coimbatore and Mysuru, and an institute in Kochi for training nurses and other paramedical workforce to deal with the new-born and mother care. The home healthcare service provider now aims to service more than 10,000 patients annually, with the expansion in their establishment pan-India, and increase in bouquet of services. Starting its operations in 2009, it targets to increase its presence manifold, to make healthcare accessible to the common man, at the doorstep. 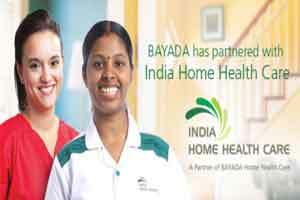 The funds for the expansions are expected to come through cash generated from the existing operations and existing promoters, including US-based Bayada Home Healthcare, which has a stake of 26 per cent in the Indian company. IHHC offers round-the-clock healthcare services, especially in the interest of senior citizens. The home care center, as a concept is growing in India, wherein patients have the comfort of recovering from a surgery, or palliative care with their family and friends. A chronic condition which requires ongoing care, or certain therapies, might require continuous attention at home. Some assistance with activities of daily living, for those treated recently or still under treatment, can now breathe a sigh of relief with professional healthcare services at their doorstep. This home-based solution deals with the desired outcome, of dealing with your health in the comfort of your home, or with surrounded by family and friends. Paramedical staff for new born and mother care has come under the direct purview of India Home Health Care, with the company announcing significant portion of their investment in training of paramedical workforce.